As far as fast-casual restaurant appetizers go, few -- if any -- are as insanely decadent as Outback Steakhouse's famous Bloomin' Onion, especially when you factor in the calorie count. And yet, the down under steak chain is unleashing an even bigger version of the deep-fried finger food and, well, you'll probably gain 10 pounds just from looking at it. 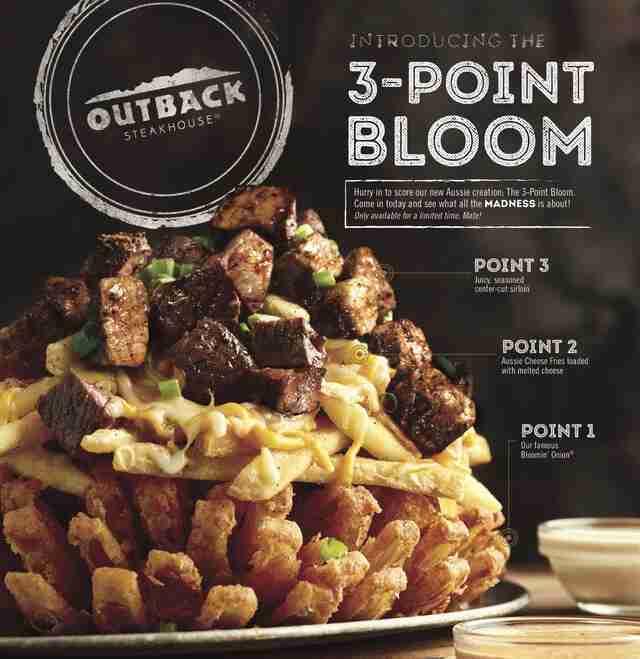 Outback calls it the 3-Point Bloomin' Onion, and for good reason. 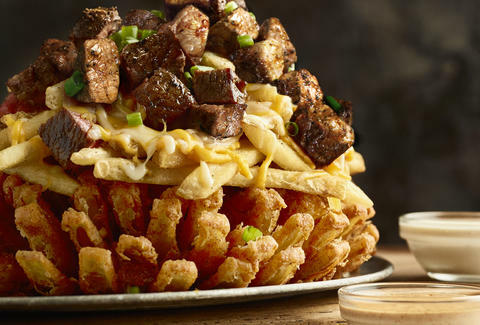 The beastly pile of fried food is made with three layers: 1) a standard Bloomin' Onion, 2) cheese fries topped with monterey jack, cheddar, and bacon, and 3) bite-size pieces of center-cut sirloin steak. Oh, and don't forget the signature spicy "bloom sauce" that comes with it for good measure. All said, the insane appetizer clocks in at a staggering 3,080 calories, although it's meant to be shared among six people, according to the company. As you may have guessed from its basketball-themed name, the new menu item is debuting just in time for March Madness. It'll hit Outback locations nationwide on March 15 and stick around through April 4, a spokesperson said. With all that food and the accompanying calorie count, it's March madness indeed. Tony Merevick is Cities News Editor at Thrillist and has admittedly not consumed a Bloomin' Onion in years now. Send news tips to news@thrillist.com and follow him on Twitter @tonymerevick.